The international organization Mountain Wilderness dedicated to the preservation of mountain areas gladly announced the foundation of its tenth chapter on November 9 2013. Due to a technical reason the MWI site team did not publish at time a press release, we are trying to correct this with this article and we deeply apologize for the inconvenience that this may have caused to various people. Right from the start, on the same weekend, the new team members took action in favour of the “Kalkkögl” preservation area . 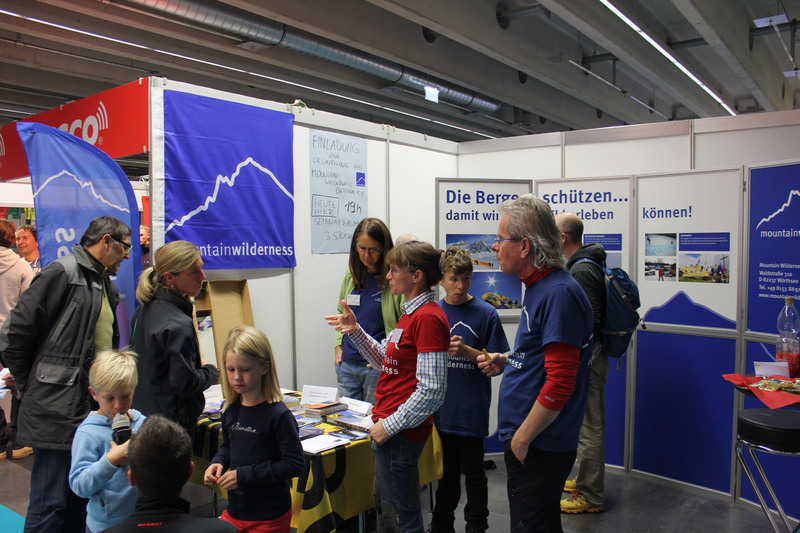 The 9Th of November, 2013, during the “Innsbruck Alpinmesse” (Alpine Exhibition), Mountain Wilderness Austria was founded. Mountain Wilderness Austria is the tenth National Association of Mountain Wilderness International. hutkeeper of Müllerhütte (Rifugio Cima libera), took on the cashier job. Right on Sunday following the inaugural event, a group of activists from Mountain Wilderness Austria climbed up from Axamer Lixum to the “Hoadl” during a heavy foehn storm, demanding “Hands off from preservation area Kalkkögel”, sending thus a first clear signal. The Austrian alpine organisation supports all efforts that help to protect this unique recreational area located just outside the city of Innsbruck. According to their statutes, a main issue of Mountain Wilderness is the conservation of unspoilt alpine nature rather than land degradation due to skiing slopes and ski lifts. The members of Mountain Wilderness Austria are firmly opposed to pooling the skiing area Schlick with the Axamer Lixum area, because the above mentioned preservation area “Ruhegebiet Kalkkögel“ protected by the Alpine Convention would be badly affected. In addition to the issues regarding expansion and overdevelopment of skiing areas, Mountain Wilderness Austria will deal, among others, with fun park tourism and the construction of ferrate. Furthermore, they will stand up for an ecologically sustainable coexistence of human beings and nature in the alpine area, so that our children will be able to experience an unspoilt alpine environment. Villach born Kurt Diemberger, representative of MW, is very happy with the foundation of Mountain Wilderness Austria. “There will be a lot of problems, some will be solved, others not. You will need a lot of patience and stamina, but mountaineers know how to deal with that”.